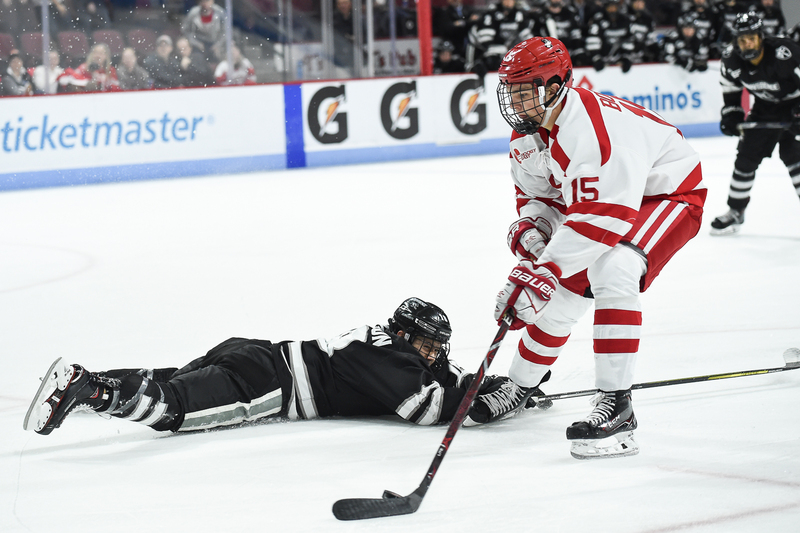 On Friday night playing against the U.S. National Development Team Program Under-18 Team, David Quinn said he saw what you might expect to see out of a young team playing in an exhibition game — immaturity. But, Quinn said when the games mattered again, his team would get its act together and right the ship. True to his word, the No. 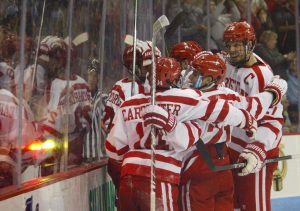 6 Boston University men’s hockey team won when it counted, defeating the University of Wisconsin on Saturday night at Agganis Arena. The Terriers (1-1) fell behind early on in the first period, but rallied for four unanswered goals to close out the Badgers (0-2-2), 4-1. Ten different Terriers chipped in at least one point in what was an all-around, clean win. As always, though, it wasn’t perfect, so we’ll take a look at what went right and wrong in this Pluses and Minuses. It was beginning to look a lot like Friday night early on in Saturday’s game. Much like the first period against the U-18s, the Terriers held a sizable shot advantage over the Badgers to start the game, more than doubling Wisconsin’s first-period shot total. However, there were no goals to show for it. But senior assistant captain Matt Lane changed all of that 1:36 into the second period. 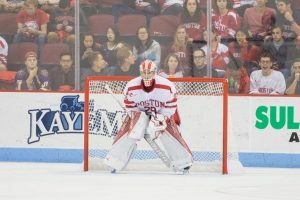 Taking a fortuitous carom off the end boards, Lane backhanded a shot over high over goaltender Matt Jurusik to put BU on the board. It looked a lot like much of Lane’s goals from the previous three years — close and down low in the dirty area. They haven’t been from far out, but Lane’s scoring has been effective nonetheless. “He’s strong, he’s quick, he’s got a good stick. He’s got good hands, he’s not easily denied,” Quinn said. “I don’t think his goals traveled, last year, he had eight or nine goals, I don’t think his goals traveled more than a foot combined. He’s off to a great start, both of his goals this year are the same. Back door, quick, picking up a puck, having the athleticism to corral it and get it in the net. 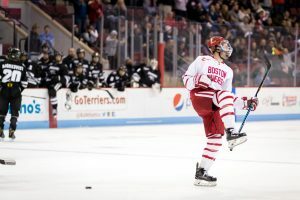 Back in the lineup for the first time this season on Friday, sophomore defenseman Brandon Fortunato looked like a player that needed to shake off the rust. When it was all said and done, he finished the night with a team-worst minus-4. But whatever rust was there was nowhere to be found against Wisconsin. He came away with two points (a goal and an assist) and a plus-1 rating. Better yet, his defensive coverage was strong and he was effective quarterbacking BU’s top power-play unit. Having a more shoot-first mentality translated in what proved to be a game-winning goal for the sophomore. Fortunato was just one of many players to make an improvement from Friday to Saturday. You can read more about that in Judy’s sider. Looking for a shakeup, Quinn adjusted all four lines and two of the three defensive pairs. To say the least, it worked. Most impressive were BU’s second and fourth lines, which registered four points and three points, respectively. 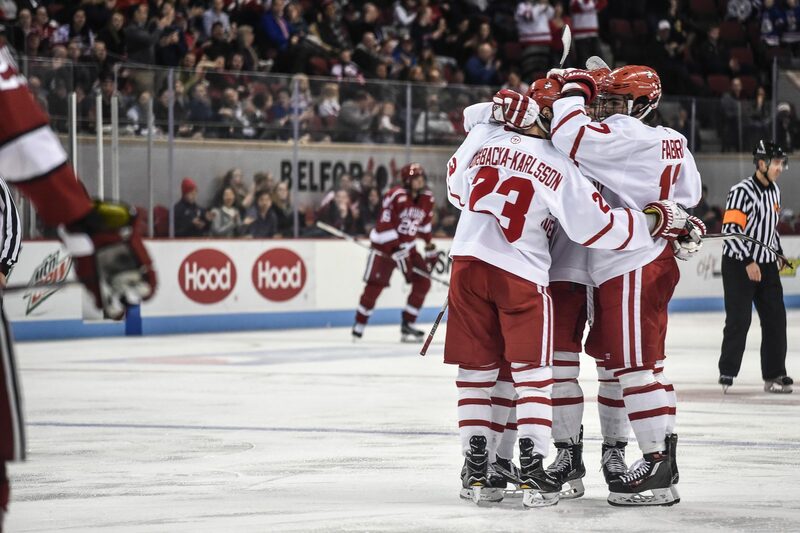 The second line of freshman forwards Ryan Cloonan and Jakob Forsbacka Karlsson and Lane combined for a speed game that Wisconsin had trouble keeping up with. Each had at least one point, with Cloonan registering two. 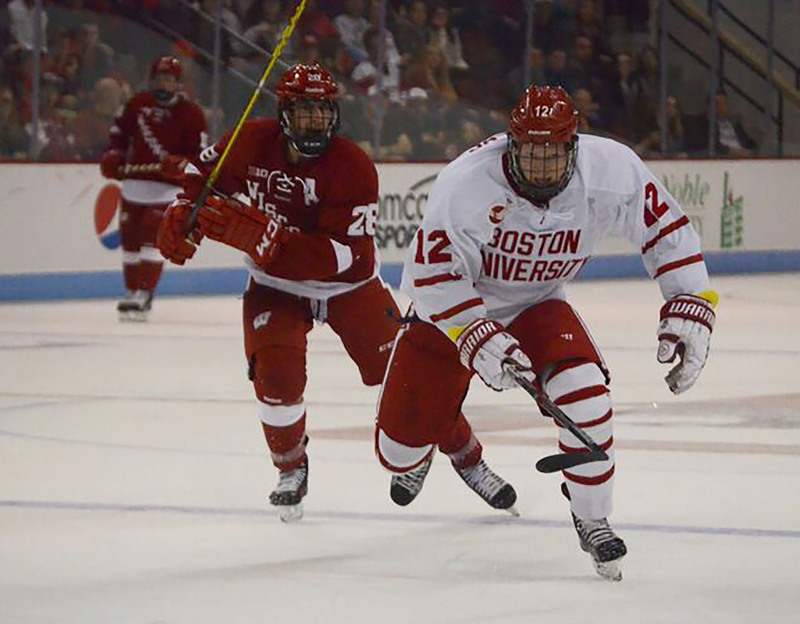 They were quick on the puck and caused a lot of trouble for the Badgers in the neutral zone. As for the fourth line, senior Mike Moran centered, while the wingers, sophomore Chase Phelps and freshman Bobo Carpenter, all contributed. 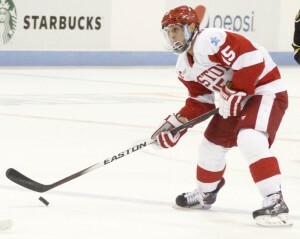 Phelps and Carpenter scored the Terriers’ final two goals and Moran had the primary assist on the last goal score. 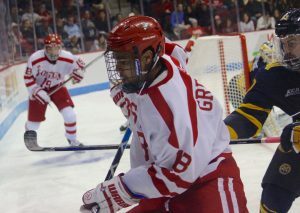 BU already has a lot of jerseys and alternates, and they added to that count Saturday night. 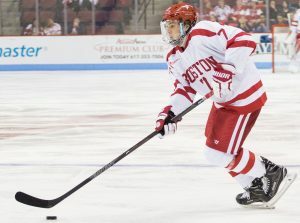 The Terriers wore a jersey that was similar to the retro red one they unveiled last season, but the base of this uniform is white and the letters and numbers are red. 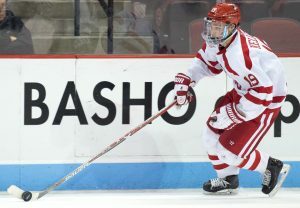 It’s a nice, clean look that I’m sure BU will use at some more home games this year. 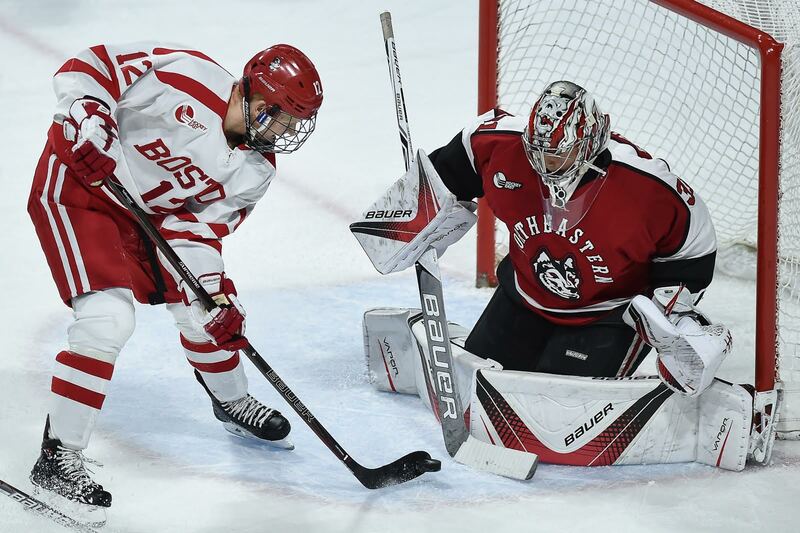 Not even a minute and a half into the game, forward Adam Rockwood somehow snuck in a shot through sophomore netminder Connor LaCouvee and the retreating BU defense. 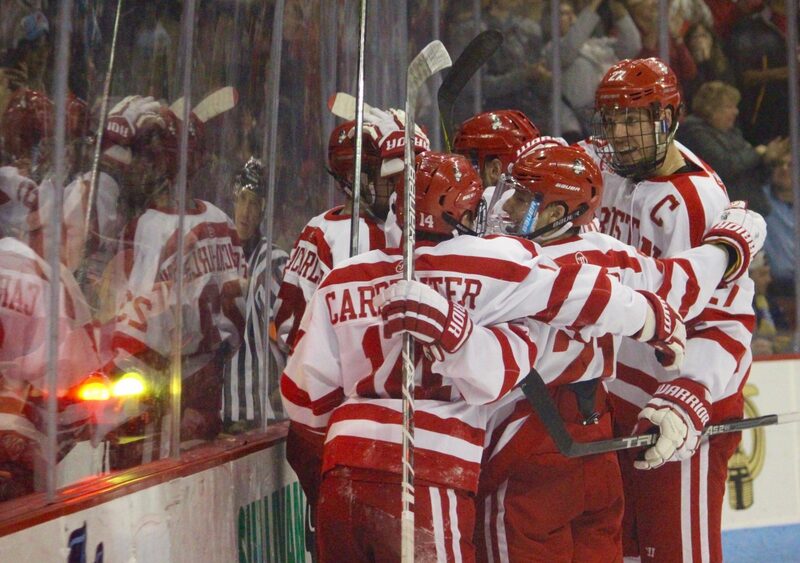 It wasn’t a pretty goal, but it gave a winless Wisconsin team some early excitement. There was a response and chances from BU, but it seemed that all of the “Grade-A” chances either went wide or were turned aside by Jurusik. 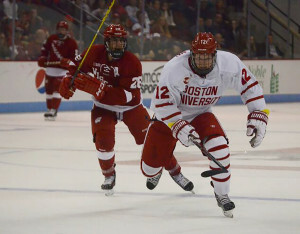 They recorded eight shots on three power plays, but the Terriers just could not hit the twine in the first period. It didn’t come back to bite them, but it could down the road against tougher competition. 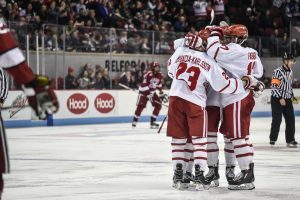 It’s a tough complaint, especially just two games into the regular season, but BU still hasn’t found its groove on the power play. 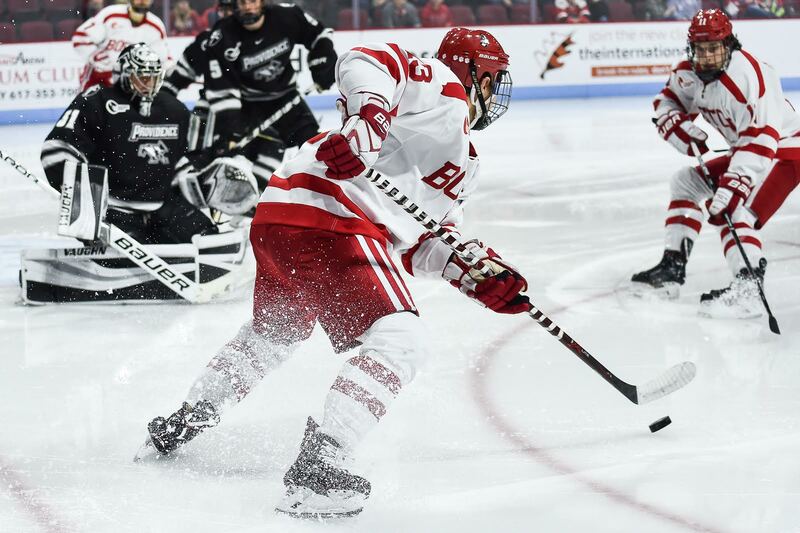 Yes, they had seven power plays and recorded an impressive 21 shots on goal, but the Terriers just converted once for a 14.3 percent conversion rate.